3 Keys To Healthcare Lead Generation. DOWNLOAD NOW! The healthcare industry is quickly changing from traditional to digital so online lead generation is more important that ever before! For maximum success facilities must follow a strategic plan, track that plan, measure the results of that plan, then make necessary steps to revise the plan. We have researched and compiled data on lead generation from facilities across the country to provide you valuable insight into this new arena for the healthcare industry. Find out what the 3 Keys To Lead Generation are by downloading this free guide + worksheet. You'll be glad you did when your traffic spikes! 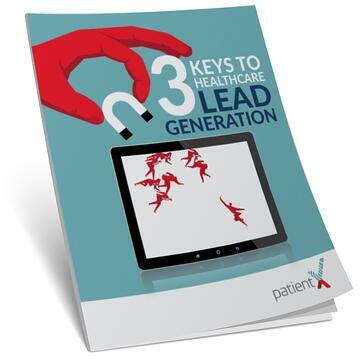 Download "3 Keys To Healthcare Lead Generation"